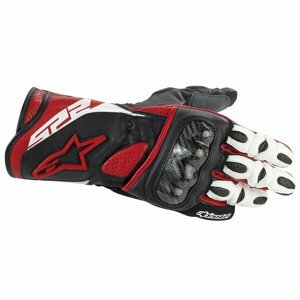 Alpinestars dances back and forth between standard consumer gear and race gear, between practicality and functionality. Some of their products bridge both of these worlds, and I would be inclined to say that this is the case for the SP-2 gloves. Realistically they're more track than travel, but they offer everything that either could need. The majority of the glove is constructed of full-grain leather. The SP-2 provides excellent abrasion resistance. The carbon fiber knuckle protector and micro-injected finger knuckle protectors distribute and cushion impact. The list of protective paneling and reinforcement goes on and on: rubber pad inserts on the palm, leather reinforced thumb, EVA padded and extended wrist protector, etc. etc. Safe? Absolutely. The SP-2 has added flexibility to all of that protection with joint appropriate articulation. A few synthetics have been thrown in here and there to make these gloves lighter. Personally, I think more should have been done for airflow. The lax ventilation brings these back to the realm of terrain-specific functionality. The SP-2 boasts a futuristic look with myriad materials that vary in color. The black, blue, and red gloves have white fingers and logos. They are a superb choice for the track, and a decent choice for the road.